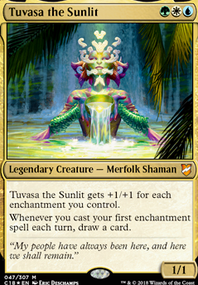 Augur is an interesting edition, however I do not like Eternal Skylord in the sideboard. 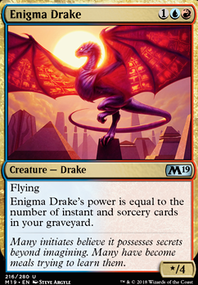 The CMC is very high for a very meh ability, and you are not going to be casting it until turn 6+ as you always want to have protection up, and by that point in the game if you are winning you should have the game on lock with Curious Obsession and counter spells. 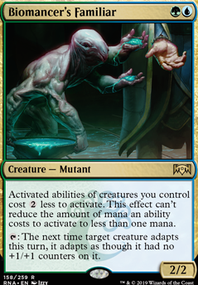 Also, has Spellkeeper Weird been any good? It takes a five mana development but it can get an instant back at instant speed, and possibly hold the ground down? And have you considered Surge Mare ? 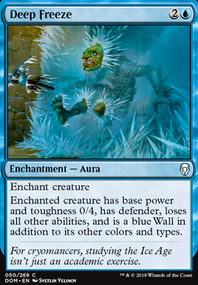 It is an extremely flexible and potent card that has caused me to lose games. I have been UB pirates on Arena the last few weeks and I seriously consider Curious Obsession one of the best cards in it. Also Siren's Ruse as a mean to re-enter Hostage Taker in longer games has turned the tide many a times. I'd personally run CO over Treasure Map Flip as a card advantage. Curious Obsession would pump the creatures beyond being unblockable, wouldn't it? Looks sweet! 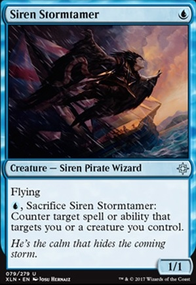 Simic is one of the more interesting colour combinations! 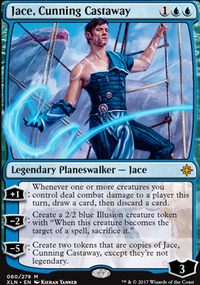 Merfolk Trickster - would combo well with Merfolk Mistbinder . Opt could work, for you to cycle through your deck quickly. 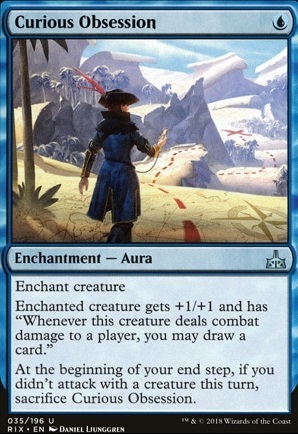 With 24 lands in such a fast-paced deck, controlling your draws will allow you to keep up tempo. An end of turn Opt gives you super-high value. Scry 1, draw one, and draw another on your turn. 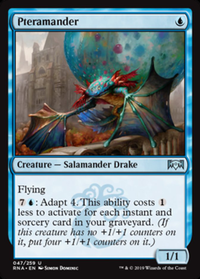 Pteramander is also a potential heavy hitter that can be dropped turn 1, and quickly be transformed into a 5/5 flyer. Have you thought about counterspells? Essence Capture and Negate are some great cards that are cheap and effective. Dive Down has already been recommended, so no need to go into that. Was also thinking Curious Obsession . Don't know how well it would play in your deck though, but throwing one on a Mist-Cloaked Herald turn two, you'll start building up your ward much faster than your opponent. Overall, I think it looks like a sweet deck! Love the straightforward and simple design, no wacky combos or complicated mechanics. It's a cheap deck that can win games, I like it! Oh yes! And I forgot! Check the mana base! The average cmc of your deck is just 2.03, which is pretty low, might be no point on running 24 lands. Experiment with 22 lands and see how it goes, my bet is that you will not feel any difference (specially with Curious Obsession feeding you cards every turn), and this could open more space to maybe get in Light Up the Stage which could help to accelerate the deck even more.